Mobile App vs. Mobile Website: Which, When, Why? More smart phones with full web browsing capability are sold than TVs, PCs and laptops in the US. Ninety percent of us keep the cell phone within reach 24/7. If you are contemplating ways to reach your mobile audience via mobile and web apps, what criteria would you use to decide? 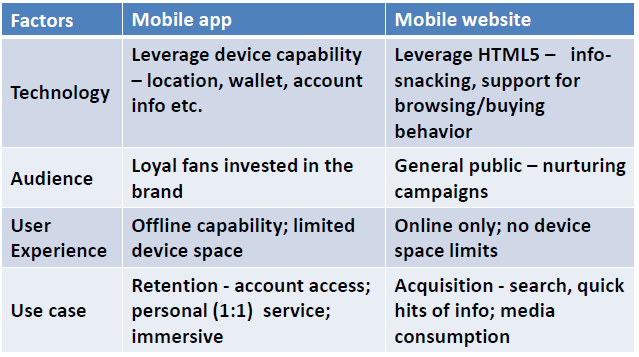 The following chart shows general considerations for investing in mobile apps and mobile websites. Here is an expanded discussion on technical considerations for investing in mobile apps vs. mobile website solutions. For a discussion on audience, fanbase, user experience and other marketing considerations, contact us. Ask yourself: Who is my audience? Do they use mobile devices? Do they prefer native apps or mobile websites? Native App audiences are generally more affluent, and the most affluent are the most active app users. If that info alone sufficiently defines your target audience, then, Bingo! A native app strategy would suit you. Be mindful that most native apps are device-specific i.e. what works on an iPhone usually won’t work on an Android or a Blackberry. If your audience cannot be defined by a single platform (iPhone, Blackberry etc. ), then expect to build and maintain several versions of your app – one for each device type. If you find that an immersive brand experience is essential, to serve existing customers and tailor the experience to their needs, interests and account-based behavior, then the tighter integration offered by native apps for each device’s native features seems the best solution. Web apps, on the other hand, are far easier to distribute. Unlike native apps, which require you to market and distribute therm, Web apps work on any device with a browser and require no download, thus their distribution is more easily supported by the Web’s linking technology. So, if your audience is broad and cannot be defined by socio-economic factors or a specific platform, a web app may be your best bet. Another perk: HTML 5 has arrived just in time. HTML5 enables app-like performance such as embedded video, so it won’t matter whether your device uses Flash Player, QuickTime, or some other installed video player; HTML 5 doesn’t need those plugins to run video. As for cost: Web development talent is not as rare and costly as native app development talent, further cementing the budget-friendly appeal of Web apps. Distribution of Web based apps is much easier, because anyone can do a web search on any device, or click on a link, to immediately use your app. Native apps, by contrast, have to be downloaded, and you will need to spend some effort and resources to promote each native app and spur people to download your app. This is not a huge obstacle, especially with existing customers, but it’s a necessary one that doesn’t apply to mobile websites. This difference is becoming less of a technical issue and more of a pure marketing /distribution issue, as technical advances have made the app download/install/update process more smooth. Ask: What will my App actually do? If you expect your app to make use of device features like GPS, account info, etc., then a native app is the way to go. Also, if you intend to engage your audience via games that work offline and only occasionally connect online, again a native app is the better choice. If, on the other hand, you plan to simply host an information-gathering user experience online, and require users to access data sources controlled by you via a Web server, then a web based app seems a better choice. A nice advantage of a Web based app is that you can completely and whimsically make daily changes to the user interface and content, and even dynamically serve targeted content, and immediately those changes become available to your Web app visitor. If you want to get instant updates and enhancements in the hands of all users, and you contemplate frequent time-sensitive updates, then unquestionably a mobile website or web based app is for you. If, on the other hand, you contemplate a relatively stable app experience that deeply engages customers, and you have secure account information or a few data sets you need to deploy, and you also require tight integration with device features, then a native app solution seems more fitting. It’s also feasible to place some Web-like (HTML) components in a native app when Web performance is needed, resulting in a sort of hybrid app – part native app, part Website. Another consideration is turnaround time for launches and changes. With native apps, that timeline is longer and rather more unpredictable than with web apps, since native apps are usually hosted by an online app store whose approval process can be lengthy and opaque – and the rejection process is often equally mysterious. You can get around the app store mystery, though, if your typical user audience is well-defined and securely controlled, such as employees, customers or organization members rather than the general public, and you contemplate launching multiple apps that each perform different sets of functions. If such is the case, consider launching your own app store and hosting your apps yourself. Chalk up another win for Web apps here. With a Web app, you only need one or two versions. A .mobi version may be necessary unless your main website is architected using, say, CSS, to re-format on-the-fly and fit any size screen. Web development talent is less scarce and expensive than native app development talent. By contrast, if you go the Native App route and need to create multiple device versions to reach various user audiences, expect a compounded cost of development, maintenance and upgrade, not to mention the coordination and management of uniform performance across all versions in your app portfolio. Only the most disciplined development teams can pull this off. Along the continuum of user experience, native apps are killer – for now. They can make use of a device’s native resources (hence their name) like geolocation, phone, camera, address book, secure wallet, etc. And they don’t require an online connection unless you want to offer some sort of group play or data interchange. The trade-off is that building a mobile app will cost you in terms of talent, lack of control over approval process and launch/update timelines in the app stores, costs and time involved in marketing and distribution, and the effort and tooling needed to maintain multiple versions for various devices. Web apps, by contrast, are relatively less costly to build and maintain because the talent is less scarce, giving you flexibility to respond to customer requirements with changes and enhancements – an attractive consideration. The emergence of HTML5 is further impetus to consider Web app versions, since HTML 5 solves performance issues, enabling web developers to create many app-like performance experiences in an ordinary Web browser. With this information in mind, think about what it would take to plan and execute a mobile experience that “wows” your audience. If you plan to create an experience that is on par with everything that exists out there today, think again. Mobile users are frustrated. This is your opportunity to outshine. What has your experience been? Still have questions? Ask away! I’ll add to these based on new information and your recommendations (use the “Leave a comment” link in the “Share this” section below). To get updates, use the “Keep in Touch” feature (top right). Thanks! What is HTML5 and Why Should We Care? This entry was posted on Tuesday, August 2nd, 2011 at 11:48 AM and is filed under 10 Most Popular Posts, demand management, Mobile. You can follow any responses to this entry through the RSS 2.0 feed. You can leave a response, or trackback from your own site.